Greetings from the Bluegrass State! This week’s images are from this weekend as I continued focusing on my passion of Macro Photography. Below are a couple of new animals that I have recently purchased as I am getting ready for my 2018 Macro Workshops. 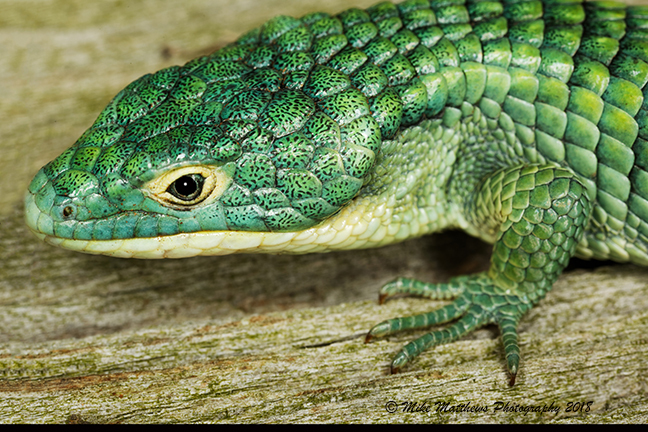 My first image is of the Mexican Alligator lizard from Central America, and his name fits him perfectly with his alligator appearance and large green scales. The next image is a Golden Tree Frog that comes from Southeast Asia and is about the same size as a red eyed tree frog and a lot of fun to photograph. There are only five spots left for my two day macro workshop with my good friend Adam Jones right here in Louisville Ky. So if you would like to know more about this workshop, please check out my web site at: mikematthewsphotography.com. Also, I will be speaking at the 5th annual Mike Moats Macro Conference in October in Cleveland, OH and will have a few of these critters there with me as well. Please click on the link below for more information. I hope you enjoy this week’s photos. Have a blessed week everybody. Contact Mike Matthews at (502) 612-6434. Payment in full is required to hold your reservation. Some special equipment may be needed. Be sure to check the Gear List at the bottom of each event. Copyright © 2019 Mike Matthews Photography. All photographs are prohibited from re-use.